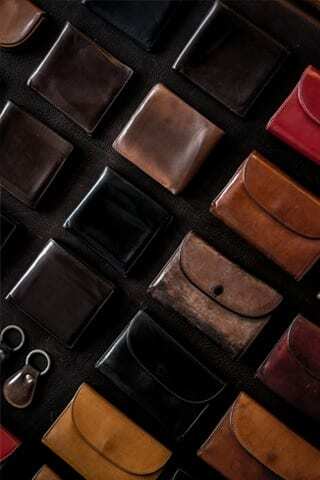 At Whitehouse Cox we use many beautiful leathers for our collection. All of our leathers are natural leathers that age beautifully. One of our signature leathers is English Bridle Leather. This leather is ‘finished’ in England. By this we mean it is lovingly hand coloured and goes through an intensive process of staining and waxing. Many coats of wax are applied to our Bridle Leather to “feed” the leather, in the same way the leather would be treated for equestrian saddles and bridles. The wax is then left for a long time to penetrate into the leather so the leather absorbs the wax naturally. We describe this as our ‘conditioning’ process. When one of our products is purchased and if the store has left it ‘unbrushed’, it could appear to have a slight white coating, this is the precious wax. However, when the owner starts to use it, the warmth of the owner’s hand and slight friction of skin rubbing against the leather will cause the wax to penetrate deeper into the leather. In time and with daily use, each wallet, purse or notecase will take on the most wonderful aged lustre and become a unique piece loved by its owner. Many stores have time to brush up the leather goods but sometimes they do not, either way the precious wax is in each and every one of our products. This is the same for all our Whitehouse Cox Bridle Leather Belts. For this reason Whitehouse Cox offers a restoration service for all our small leather goods and belts bought from our web site because many owners simply do not want to part with their beloved aged item that has become unique to them. We have had some belts returned to us over 20 years old with a request to re-stitch a buckle because the owner does not want to part with their belt. Of course we recommend to each of our customers to buy several pieces to use alongside each other so they all take on an individual character and the owner can have an ongoing Whitehouse Cox collection of special aged pieces. We can say with confidence “Each Whitehouse Cox piece will be unique”.